I love living in the least populated state in the Union, but it does present some challenges as a designer. Sometimes I have to drive great distances to find the product that I need. Yesterday I spent eight hours in the car. The road from my house to Salt Lake City winds through many places even radio is hard to receive, so that meant lots of quiet time thinking or conversing with my husband (I hope there are always spots in the world where radio and phones don’t work). We went to Salt Lake to hunt down amazing stone slabs for a remodel, and naturally, some of our conversation turned to kitchens. While I may not totally agree about the double ovens, I loove the idea that wall-hung cabinets are going to become a thing of the past. 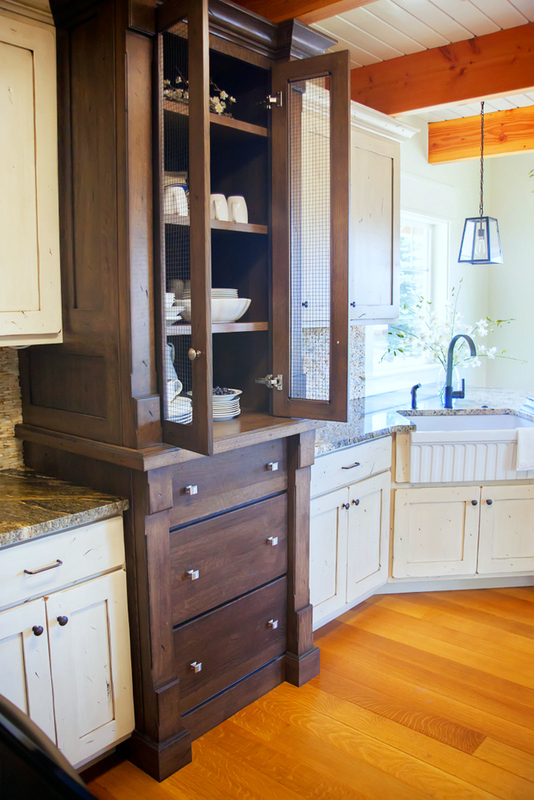 Intuitively, for years, I’ve tried to eliminate wall-hung cabinets where possible, instead opting for cabinetry that had the appearance of “furniture” that came all the way to the counter or floor. It’s the first thing I did in our own kitchen remodel. Yes, yes….I know my china hutch is squished in between wall-hung cabinets, or “uppers”, as we say out West. I don’t think they’ll entirely disappear (as granite won’t either), but I’m completely enamored and excited for this movement. I believe it is bigger than a trend. The next generation isn’t caught up in collecting things; we’re excited about experiences. Aesthetics and art matter, so the simplification and opening up of kitchens will follow. Windows and streamlined open cabinets will continue to replace the bulky, stodgy upper, because we want to see birds and feel the sunlight. What about you? Are you excited to see “uppers” go away?